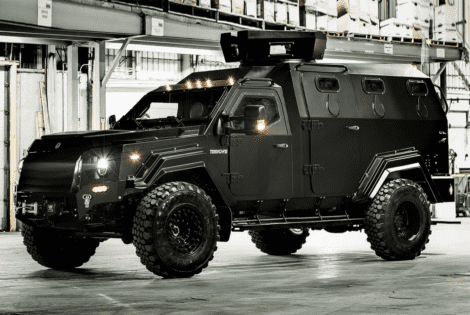 Terradyne introduces the Gurkha MPV, an uncompromising 4x4 built to stroll on through a war zone and come out smiling. Its armor rating of B7/STANAG 2 basically means that it's ultimately a moving fortress. It's forged to withstand blasts from grenades, mines, artillery, and even take several shots from 7.26x51mm armor piercing rounds like a champ.